This trail shadows the steep walls of the Red Cedar Valley for 14.5 miles from Menomonie to its connection with the Chippewa River State Trail. 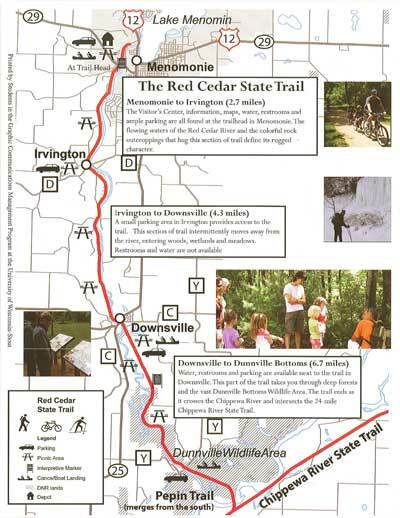 Along its route, the Red Cedar trail passes through the communities of Irvington and Downsville and the Dunnville State Wildlife Area. The trail is surfaced with fine limestone screenings and is open for walking, running, bicycling, cross-country skiing and snowshoeing. The trail is part of the larger Chippewa Valley Trail System. In the Dunnville Wildlife Area, the Red Cedar trail connects to the Chippewa River State Trail. At this junction, the Chippewa River trail continues south into Pepin County for about 6 miles to the town of Durand or north for about 20 miles to the city of Eau Claire. The trail takes users through the scenic Red Cedar River Valley, passing by prairies, marshland bottoms, forests and farmlands, indluding sandstone bluffs and other unique rock formations. Wildlife that may be spotted along the trail includes sandhill cranes, bald eagles, red shouldered hawks, songbirds, turkey, grouse, pheasants, fox and deer.